This blog wants to shed light on sacred works by composers of classical music. Carmina Burana is a scenic cantata composed by Carl Orff, with optional mimed action, in 25 movements for soprano, tenor, and baritone soloists, boys' choir, choir and orchestra (Fourteen of the movements include the choir). It was first performed in Frankfurt in 1937, San Francisco in 1958, London in 1960 (concert) and continues to be a popular concert choice. The text is a collection of songs about wine, women and love - based on poems in Latin, Old German and Old French from a manuscript dated 1280 found in the Benedictine monastery of Beuren. 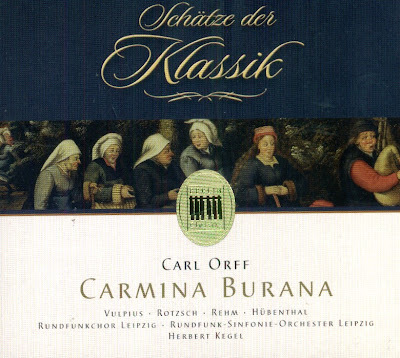 Carmina Burana is the first part of Orff's trilogy "Trionfi", the two other works being Cartulli Carmina and Trionfo di Afrodite. The Compact Disk was released by Berlin Classics, 1960/2008, (ADD). Berlin Classics 0014372BC.